"...And Now, the Absorbing Man!" The Hulk has a dim memory of Banner's recent ability to keep Hulk's persona in check, and vows that Banner will never hold him prisoner again. His thoughts about his recent happiness with Betty confuse him, and he passes out, only to revert to Bruce Banner. Elsewhere, on the Army base, Major Talbot is being informed of a meteor being tracked by satellite on crash course with Earth, a potentially extinction-level event. News gets out to the general public, and Banner comes to the base to offer his services. He volunteers to pilot a space craft, armed with nuclear payload, to intercept the meteor in space. Banner succeeds in his mission, but in the close encounter with the meteor, picks up an unintended hitch-hiker, the Absorbing Man, who had been stranded in space since his battle with Thor (see Thor #123). 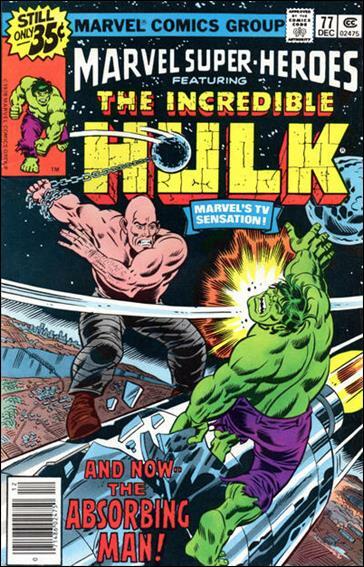 Banner sees the evil intent in Crusher Creel's eyes, and his racing heart triggers his transformation to the Hulk. They begin their slugfest on a rocket at the edge of space, but soon crash to Earth to determine who is the mightiest, as an odd collection of youth gather nearby to await the outcome. (18 pages). Reprinted from Incredible Hulk (1968) #125. Reprint notes: 18 of original 20 pages presented, omitting pages 2, the first 5 panels of page 3, and the first two panels of page 4. Cover a recreation of original art by Herb Trimpe.